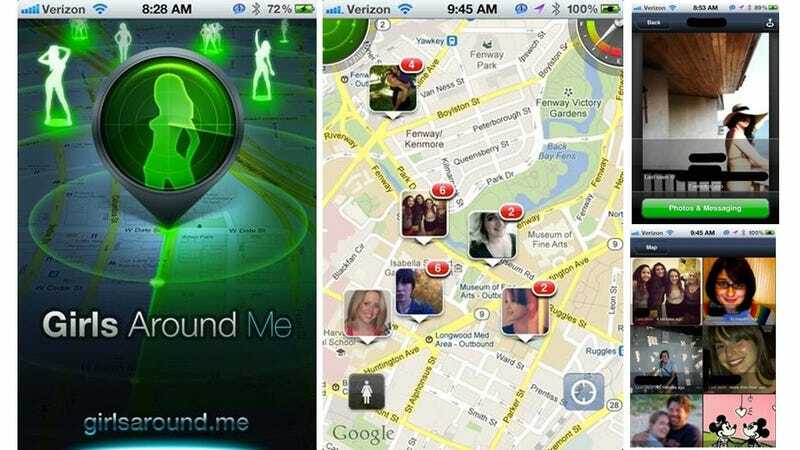 After Foursquare cut off access on Saturday to the charming "Girls Around Me" app that made it possible to view the location of women on a map and their publicly available Facebook data and pictures, app's Russian developer, i-Free Innovations, issued a statement defending its right to streamline predatory stalking. According to the Wall Street Journal, i-Free averred that it is "unethical to pick a scapegoat to talk about the privacy concerns. We see this wave of negativ[ity] as a serious misunderstanding of the apps' goals, purpose, abilities and restrictions." And what does i-Free believe its app's goals were, exactly? Well, never mind the fact that all the data "Girls Around Me" provided was public anyway — all it was meant to do was help users discover public venues nearby...venues populated with unsuspecting women. "This," according to the Journal, "despite the name of the app, "Girls Around Me," and the fact that its promos show women in provocative poses." Whoa now! It's not everyday that you get a heavy dose of wry wit and sarcasm in your Wall Street Journal news updates, so everyone take note — i-Free made a creepy little stalking app that only helped people sneak up on other people, and though I'd rather go the rest of the weekend without bringing up noted egomaniac Vincent Gallo, I believe he has an important perspective on the inherent danger of "Girls Around Me": "I don't trust or love anyone. Because people are so creepy. Creepy creepy creeps. Creeping around. Creeping here and creeping there. Creeping everywhere. Crippity crappity creepies." Indeed they are, Mr. Gallo, indeed they are.